"Whoops...did I mistakenly print that to screen?" 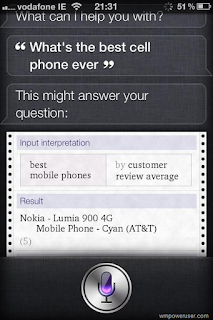 Well, we guess it's official: Nokia's Lumia 900 is 'best cell phone'. Apple's Siri says so. But that's not what got them in trouble and brought howls of laughter from long-suffering Nokia fanboys. In the absence of a carefully scripted answer, Siri is supposed to ask some 'computational knowledge' gizmo instead of a reliable ol' 20th century search engine. Big mistake. Siri ends up parroting a dubious response from Wolfram Alpha and some unspecified user survey instead of Google's more tactful, nuanced suggestion: a Top 5 list. C'mon, Apple -- spend a few bucks for the good stuff, Ok? 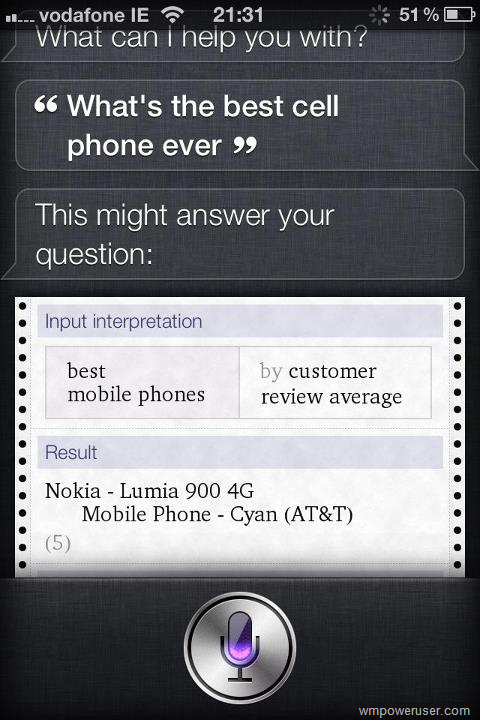 Update: (14 May) Looks like Siri has been shown the error of her Lumia-lovin' ways. Can't be sure if she received a stern talking-to, a big fat 'cooperative marketing' payment or a couple rounds of electro-convulsive therapy. 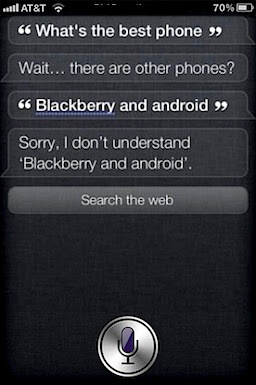 But whatever the cause, Siri now dodges the question, "What's the best cell phone?" by playing cute. The political tone of the responses leads some to suggest she's been flashed with Mitt Romney's firmware. MobilePhonesFan finds the very idea simply ridiculous. Everyone knows that Mitt runs on Informix Universal Server web blade, not C++. Duh.